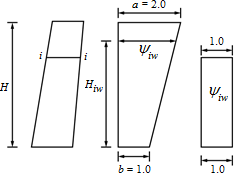 Only horizontal seismic force is considered according to JTJ 004-89.
ψiw isn't considered when H ≤ 12 m which means parameter a and b don't work when H ≤ 12 m. a is the top value of the distribution map and b is the bottom value of the distribution map. When computing seismic earth pressure, Coulomb theory is used and unite weight of soil γ, internal friction angle of soil φ and angle of friction structure-soil δ is replaced by γ / cos θ, sdasdasd φ - θ, δ + θ, where θ is seismic angle (Art. 3.1.6). Seismic angel θ is determined by different option of seismic fortification intensity. The above formula is as same as Art. 4.2.3 in GB 50011-2010 (Code for seismic design of buildings). Suggested values of ξa by different standards can be found here.